We’ll open the event with a spiritual message from Guenther followed by a Healing Soundbath Concert with Elivia allowing us to open and heal from a cellular level. After a brief intermission you’ll be guided through a gentle, all levels appropriate, Yoga class designed to build upon our Soundbath Concert energies. This event will sell out, so be sure to get your tickets early. Guenther Krammer is an active Practioner in the Arts of Holistic Healthcare, working within the Healing elements of Shamanism, Bodywork, and Sound. 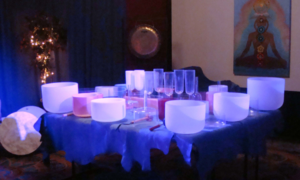 Elivia Melodey is a renowned Crystal Sound Master, a trance medium, and recording artist. With the release of four critically acclaimed CDs, she established herself as a recording artist whose music is used in healing and spiritual centers around the world. Channeling the music of the Angels, her music is transformational, balancing the body’s energy centers and opening new doorways of awareness.